Korean. Fried. Chicken. Tacos. Do I have your attention? Let me explain. 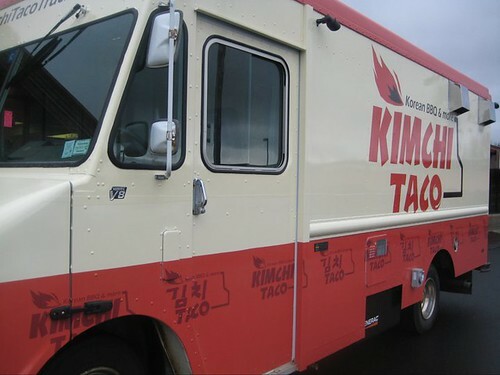 The Kimchi Taco Truck is ringing in 2013 with new items on their mexi-korean menu. Starting Monday (January 14) look for burritos stuffed with Korean BBQ short rib, seared spicy pork, grilled chicken or tofu edamame falafel. Korean burritos are nothing new, but there are a couple new taco options as well, including a fish taco served with mango salsa and a Korean fried chicken taco. Korean fried chicken taco? I’m definitely down for trying that! But that’s not all … to celebrate the launch, the truck will be running a promotion next week (from January 14th to 18th) where every tenth customer will receive deals on the new menu items, including free or $1 tacos and $5 burritos. Not the tenth customer? Don’t worry, special promotions will also run on their twitter account and facebook page. The truck plans to be in Midtown on Wednesday at 55th btw. 6+7th and Friday at 47th and Park 11:30 a.m. to 2:30 p.m., so I’ll meet you on line for those Korean fried chicken tacos! Posted by Rachel Goldner at 3:30 pm, January 8th, 2013 under Kimchi Taco Truck. Wait – you’re telling me they’ve had these for a whole year and you sat on the story? I smell a coverup! I smell a typo. Thanks for pointing it out! The edamame falafel sort of reminds me of delicious edamame gyoza I had in Tokyo. Seasonal, to be sure, but matched very well with kurobuta. Since this is a Korean (-ish?) truck, let’s just rename the gyoza to mandu and see those as an appetizer.